When he was 16 years-old, Oscar, who was already fluent in French and enthralled with classical Greek literature, enrolled at Trinity College in Dublin. He won a scholarship to Magdalene College in Oxford in 1875, where his love of art and reckless abandon began to blossom. Oscar’s poetry was published in several literary magazines in 1875 -1876. In 1878, he began writing poetry more seriously, and he was awarded the prestigious Newdigate Prize for English poetry with Ravenna. Soon after, he left Oxford for London to make a name for himself among the literati. Wilde certainly knew how to make a statement. Not only was he a brilliant poet, writer and speaker, but also a “Professor of Aesthetics”. He was certainly hard to miss with his long, flowing hair, decked out in velvet frock coats, knee breeches and lace cuffs – every inch the impeccable dandy. After Oscar self-published the volume Poems in 1888, he embarked on a lecture tour of the Unites States. When asked at customs if he had anything to declare, the foppish Wilde supposedly replied “Nothing but my genius.” Oscar traveled the entire nation, establishing himself as an expert on all things pertaining to art and taste. In 1884, Wilde married Constance Lloyd, an outspoken, well-read woman four years his junior. They quickly had two sons, Cyril in 1885 and Vyvyan in 1886. He was now entering the most creative period of his life. Wilde’s only novel, The Picture of Dorian Gray, was released in 1890. It caused a furor due to its implied homo-eroticism, which would come back to haunt him just a few years later. Lady Windermere’s Fan, Oscar’s first play, was such a financial and critical success when it premiered in 1892 that he continued to write for the stage, crafting such classic plays as A Woman of No Importance (1893) and The Importance of Being Earnest (1895). The Marquis of Queensberry decided to make Oscar Wilde’s life as hellish as possible in the hopes that he would abandon his son. 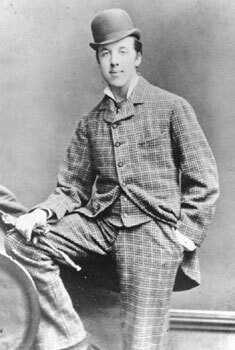 He made an unsuccessful attempt to disrupt the opening night of Wilde’s play The Importance of Being Earnest, and left a calling card for Oscar that read “Oscar Wilde posing as a somdomite” [sic] at an elite London establishment. Although most of his friends were against the idea (except for the ever-devoted Bosie), Wilde filed a libel suit against the Marquis. Oscar ending up withdrawing the charges, but he was arrested and convicted of gross indecency for homosexual acts with men. Interestingly, none of these acts included his constant companion, Bosie. Wilde was sentenced to two years of hard labor, which was the beginning of the downward slide that led to his death. While imprisoned, Oscar wrote The Ballad of Reading Gaol, which chronicled his misery. After his release in 1897, he immediately hooked back up with Bosie (temporarily it turned out) and moved to Paris. He underwent surgery to treat a reoccurring ear infection, but it developed into an abscess. This led to cerebral meningitis, and he died at age 46. But being Oscar Wilde, he couldn’t leave the planet without making a statement on the aesthetics of his surroundings, and apparently the wallpaper of the room he was dying in was offensive to his sensibilities. “One of us had to go,” he insisted. Actress Olivia Wilde’s real name is Olivia Cockburn. She took the professional name “Wilde” in high school in homage to Oscar Wilde. Olivia Wilde’s mother is 60 Minutes producer and award winning journalist, Leslie Cockburn. Her father, Andrew Cockburn, is also an award winning journalist. In addition to that, her aunt and her grandfather were also professional writers. The above “mini-biography” of Oscar Wilde omits mention of the final and most important chapter of his life. Knowing that Wilde’s native land, Ireland, was very predominantly Catholic, many readers here probably assumed that he himself was a lifelong Catholic. Such was not the case. Instead, he was baptized in an Anglican church as an infant and considered himself to be a non-Catholic until near the end of his life. Wilde experienced a spiritual renewal while in prison. Later, when he became extremely ill, he requested that a Catholic priest be brought to his bedside, so that he could be received into the Church. Oscar Wilde knew that he had done very wrong — gravely offending God and his fellow man through his unchastity and other sins — and he was sorry for them. God gave him the chance to repent and to join him in Heaven, and he accepted the chance. Marvelous!